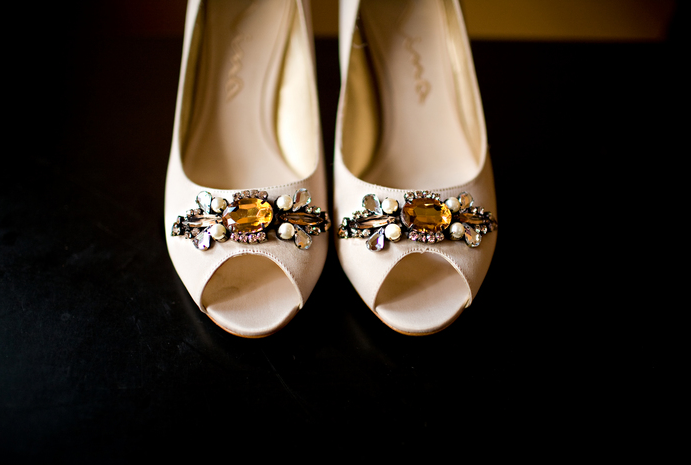 My favorite photos in any wedding album are always the shots of the bride's shoes. I love the artistic angles photographers utilize to capture what is usually one of the most beautiful pieces of the wedding day. 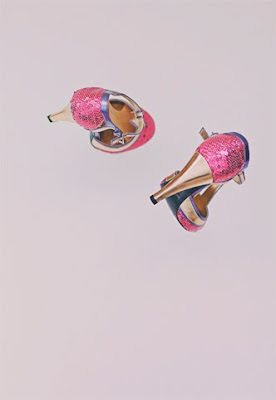 And I love that I am seeing less of the infamous white satin, pointed toe heel in favor of more jazzed up, bedazzled stilettos, pumps, and even flats. These are some of my favorite shots (and shoes!). ...but let's face it. If that day ever comes, I'll probably be in flip flops. 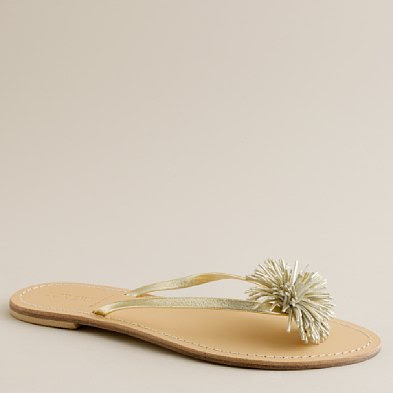 Really cute flip flops. How about you? 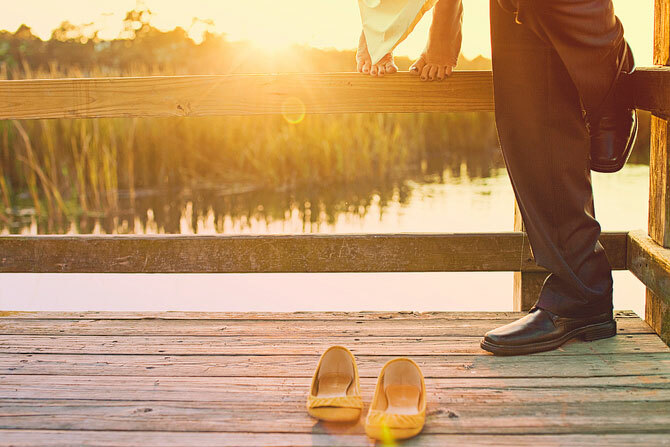 What color shoes did or would you wear on your big day? And do you have a picture of 'em? I do have pictures of them. I was happy with them, mainly because they were cute (I thought) and super comfy. 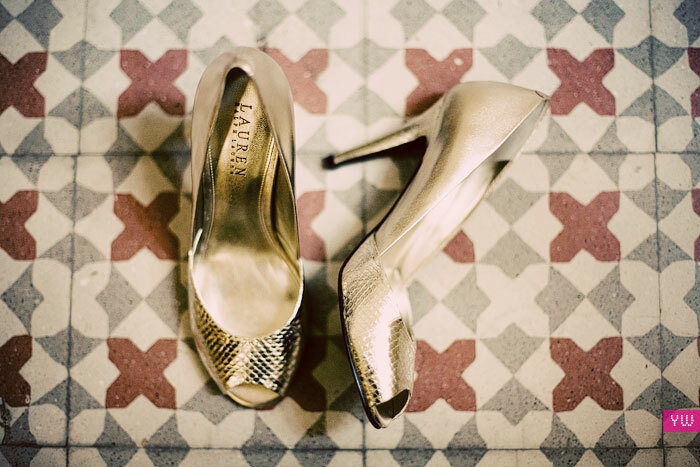 The last thing I wanted was foot pain on the big day and my shoes didn't bother me at all! I love shoes in jewel tones. Such a fun post! I am wearing mine to work today. Super cute and comfortable - purple Kate Spades!! 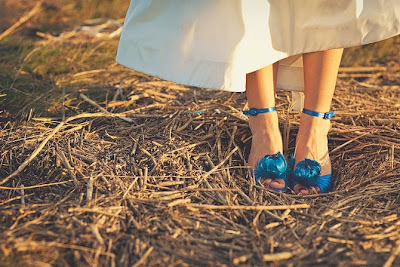 Loved my color shoes at the wedding, so glad I didn't go the tradition white!! What a fun post on a sunny Friday! I wore gold peep toes on my wedding day and I am still wearing them 6 years later. They are some of my favorite and most comfortable heels. I wore those clear, pageant-type heels and my toe nails were bright red (why, I don't know!). Of course, I got married 10 years ago so I'm sure it was more cool then! All I know is that Red on the bottom of a shoe means Louboutin or is it Louis Vuitton? Green. Sigh. I loved them. Still love them. I am wearing either blue or purple or something else if it makes me fall in love. I hate the traditional bridal shoe and not much else about our wedding is going to be all that traditional so why should the shoes be? I thought blue shoes for my something blue but now I have my great-grandmother's earrings that have blue in them so I'm now free to pick ANY color I desire!! 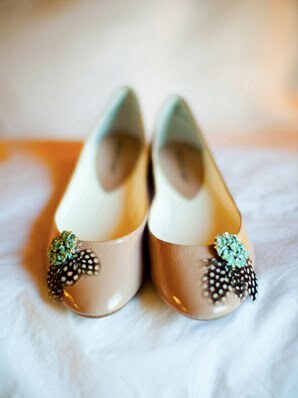 Love when a bride wears anything but a white/ivory shoe. My niece Jennifer wanted a holiday theme for her January 2 wedding. Her red shoes were the first thing I noticed - fabulous. 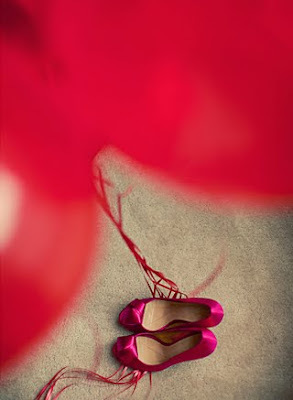 Nothing could be better than the red bottoms of a Christian Louboutin shoe. i absolutely agree! 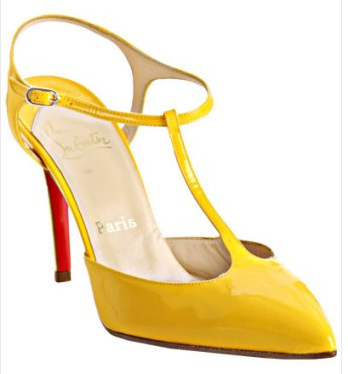 I think I would go for something blue like the Louboutin ones! 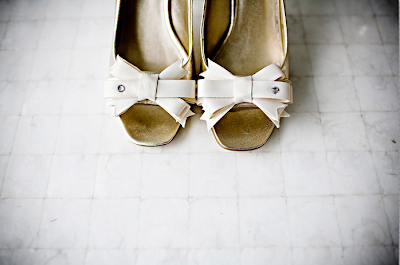 I love seeing the shoes brides wear on their wedding day. It is like a secret surprise! By the time this Single Nester finds her man, I might just be wearing orthopedic Easy Spirits for my walk down the aisle. 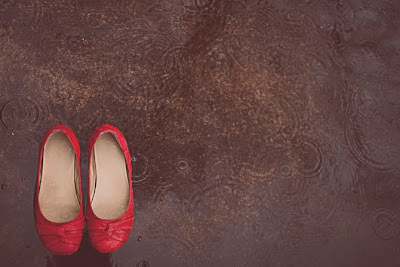 I loved those shoes and my awesome photographer for taking such a lovely picture. It made my day to see them up here! Blue wedding shoes seen here. I'm with you on this...I love seeing their shoes. Let's try this again with a SMALLER link! I'm not planning a wedding yet, but when I do, I will do everything in my power to get the turquoise flats I mentioned in my blog post here: http://9-oh-6.blogspot.com/2010/03/who-knew.html, that I originally found on Style Me Pretty. I have yet to track them down... anyone know where I might be able to buy them?!? I'm right there with you about the wedding shoes. I have NO idea what my dream wedding dress would be. But I probably have about ten pairs of shoes on my "must have" list! Love your blog, and keep us updated on your apartment. Very inspiring stuff. I just started revamping some things in my little place, as well, and you've just given me another jolt! This needs to be in my sunroom.